Peshawar, 16 October 017: PIMA Peshawar arranged a CME Seminar on “All About Pain*” at Peshawar Medical College on 14 September 2017. 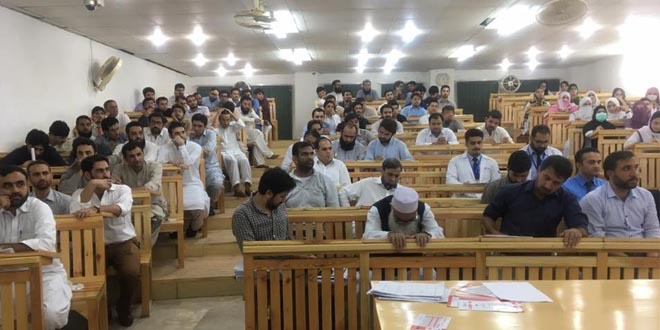 This program was addressed by Prof Muhammad Subhan, Head of department of Medicine PMC; Prof Tehniyat Ishaque, head of department of Obs & Gynea PMC; Dr Mahmood ul Hassan, Head of department of Orthopedics PMC; Dr Mohammad Bin Afsar Jan, Principal Physical Therapy, RMI; and Dr Ibrar Ahmad, Assistant Professor & Consultant Endocrinologist LRH. What’s new in headache treatment? Chronic Arthritides: Indications for surgery.